A comment from Deirdre on my recent post about learning styles really made me think. I've been learning about sewing for so long - do I have some lessons to share? At first I leaned towards 'no'. I only consider my skills beginner/intermediate. I'm still absorbing so much information from others, and have so far to go. On the other hand, I have improved my skills recently. I initially learned to sew from my Mum - probably 25 years ago. But until I threw myself in the deep end by sewing alone, here in Auckland, I never challenged myself much or developed new skills. An early attempt at eveningwear. That's me on the right, about 10 years ago. The first thing I sewed without help from Mum was this shiny poly-satin ballgown, on a 30 year old machine I found in the basement of my university dorm. I cut it out on the shared kitchen table, as there wasn't enough space in my room. Thankfully, it wasn't a disaster! After getting so much help from the online sewing community, I'd love to give something back... even in the smallest way. I'm going to share, in a series of posts, ten concepts that I think have improved my sewing. They aren't new or innovative. A lot of them could be extrapolated to other hobbies (hey, maybe I could expand this idea to photography!). Each week, there will be a new concept or idea to discuss. If you bookmark this page, I'll add a link to each lesson as they're posted. Hi Kat, I'm really looking forward to these posts. It all helps. I'm sure I learn more from you than you will from me! But I know as/when I was a beginner, sometimes it helps to have someone who is not 'too far ahead' to help with questions. I doubt that I'll intimidate anyone! Your first solo project looks amazing! I love the story that goes with it, too. I loved making it, and all my college friends were suitably impressed. It was pure coincidence that my dress coordinated so well with my friend Erin! Love this idea. Eng ball??? 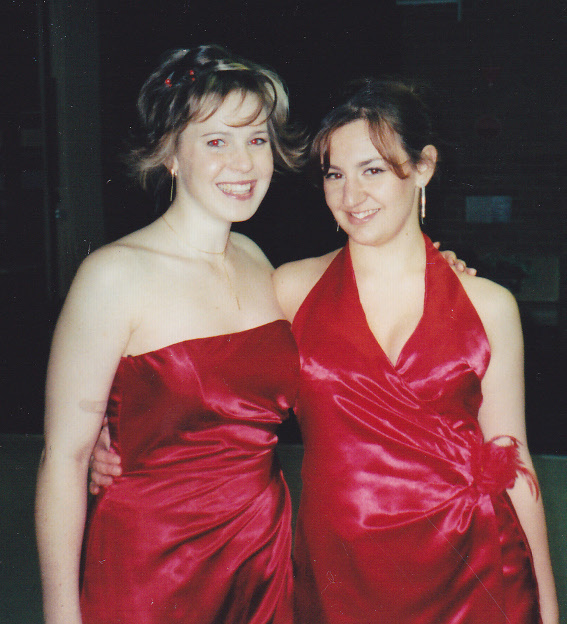 It was a Howitt Hall ball, I think... but possibly I wore it to an Eng Ball too. Either way, it would have seen quite a bit of VB and craziness! Look forward to reading - love the red gown. Thank you - I think I still have the dress, but it definitely won't fit! I'm looking forward to putting the posts together.